1. I have been incredibly busy with work for the school. 2. When you have nothing positive to blog, it’s best not to blog anything at all. I posted awhile ago about the responsibilities at my school for BEDA. I also mentioned that I had spoken with the coordinator regarding the issue of me being left alone during one of my classes my first week. Well, even after the coordinator called and spoke with my school, they had a meeting with me and informed me that I would be left alone with the students because that was the way that they had designed the auxiliar hour to function. I didn’t bother to mention this again to my coordinator because I thought that maybe I could cope with the situation. I was able to deal with that aspect pretty well, just like I thought. However, I could not get use to the amount of students that I was responsible for and the amount of lesson planning that I had to do. I spent over 7 hours on Sunday researching lessons and videos for my 6 Monday classes. I knew this week would be the true test of whether I could handle being at this school because it was the first week with full school days. All of September was half days, so I didn’t have the majority of my assigned primary students. Turns out that this school and I are just not compatible. I had a complete breakdown yesterday and made the decision to call the coordinator again first thing in the morning and tell her that I could not handle the situation at my school. During my commute to the school this morning, I called the coordinator and explained my situation to her and she offered to switch me to a different school. I happily agreed. I should mention that my main issue with the school was that they were treating me like I was a legitimate teacher rather than an auxiliar. Tomorrow I have my NIE appointment at the comisaria at 8:30 in the morning and will be starting at my new school afterwards. My new school is in another region of Madrid, so I won’t even be in Majadahonda anymore. My commute will likely be a little longer and I’ll be working less hours, but I will GLADLY make those sacrifices in order to maintain my sanity. I’ll keep you all posted about the NIE appointment and my first day at my new school. My first week at the school ended pretty well after I spoke with the principal. The students are pretty great and have a decent level of English. The activity that I’ve done with all my classes (except for 2) during my first class with them is interviews. They have to pair up with the person next to them, interview each other, and then present to the class what they learned about the other person in English. The students did great with that activity! They all were really eager to participate and were pretty creative with the questions they asked one another. Afterwards, if we had a few minutes to spare, I would let the students ask me questions. The questions that I got asked the most were: Where are you from? What does your tattoo mean? And how old are you? I did a slightly different activity with one of my smaller, older groups. I took out a roll of toilet paper and told them that they should grab as much toilet paper as they believed they would need for the activity, but that I couldn’t tell them what the activity was until after everyone had their toilet paper. Afterwards, I told them that for each square of toilet paper they had, they had to tell me a fact about themselves. This game is always fun since, inevitably, someone takes half of the roll. This time around, a girl had 36 squares. After we finished that activity, we did a Guess the Celebrity game. In this game, you think of a Celebrity and you have to give the class clues (In English) that describe the celebrity until someone guesses correctly. It was really fun and a lot of the students in the class are really funny, which makes the class even more enjoyable. Could you all leave a comment below stating what grade(s) you are assigned and what you are expected to do during your time with them? For example, are you just aiding the teacher teach their lesson or are you expected to teach lessons with the supervision of the main teacher? And if you are a former auxiliar de conversación, tell me what what age group you had and the types of things you did in the classroom. It seems that there is a large discrepancy between schools regarding what the auxiliares de conversación are expected to do and I was trying to get a feel for what the majority seem to have. I had to email the BEDA coordinator today because I found it weird that my school expects me to be alone with my students starting in October and teach them my own plans. After looking at my contract with BEDA, I noticed that it said the teacher should be with us at all times. The coordinator responded to my email saying that I am, in fact, NEVER to be left alone with the students and that she is going to call the school tomorrow to sort it all out. She didn’t address my other question, however, which is me teaching the students lessons of my own making. The school said it can be related to the subject (i.e. History/Geography) or be pretty much exactly what the students are learning, but in English. I guess I never expected to be actually teaching at my school since BEDA doesn’t require any education background in order to be in the program. I assumed that I would just be a teacher’s aide, which is, obviously, not the same thing as a teacher. We’ll see what my schools says after the coordinator speaks with them. I, at least, feel better knowing that even if I do have to teach, the teacher must be there with me. Even though, today was my first day in the classroom with my students from 2 of my 23 assigned classes and I felt that the class where I ended up being left alone went better than the class where the teacher was with me. My first class was with the freshmen and getting them to answer my questions or ask me questions was like pulling teeth. Even with the teacher prompting them with questions they could ask me, they still weren’t really participating. My other class was with the 3rd graders and their teacher introduced me to the class, said I was there to teach them English, and proceeded to leave. I was alone with them for the entire hour. I thought it went pretty well considering the circumstances. I had to raise my voice a few times to tell them to settle down or be quiet, but at least I was able to get through the tasks I wanted (which was just asking them questions and making them go around the room answering). I had no idea what subject they normally have during that time period and it’s not like the teacher was there for me to ask. Plus, I wanted to get a feel of their English level. I’ll write some more tomorrow with an update about what my school said in response to the coordinator getting in touch with them. Oh and I already have so much to talk about in regards to the textbook quality and the relationship between the students and the teachers. Quite a bit different from the U.S.
Back to School. Back to School, to Prove to Dad That I’m Not a Fool. That song from Billy Madison always gets stuck in my head for the first day of school and today was no different. Granted, this was my first day of school as an auxiliar de conversación, which is infinitely more exciting than being a student (at least in my opinion). I woke up today at 6:15 and after getting ready and commuting, I arrived to my colegio around 9:00. The principal took me around the school and introduced me to the majority of the teachers (this took about 2 hours). Afterwards, I met with the director of primary levels and he gave me my schedule for the primary grades. And then, I met with the director of the secondary levels and he gave me my schedule for those grades. That’s right, I will be working with all of the grade levels. Ages 3-16. When I realized this, I was slightly taken aback, but it wasn’t until they told me that starting in October, the hour that I work with each grade is my time. As in, I will be responsible for coming up with a lesson plan that works in conjunction with what their teacher is teaching them and I will have to teach it to them. By myself. Alone. Without the teacher being present. My initial reaction was to panic, but I figure that if the past auxiliar could handle it and he is now a teacher at the school, it can’t be all that bad. And he said he’s more than willing to help me out and give me tips/ideas, which I really appreciate. Oh and the course that I will be teaching in secondary grades is History/Geography. Of course, I have no idea what history they’re learning. If it’s the history of Spain, I know next to nothing so it will be a learning experience for all parties involved! And for the month of September, the school lets out around 1:50 so I won’t start working the full day until October. I like and dislike this at the same time. Obviously, I enjoy getting out of work early but that means I won’t be meeting some of my classes until October. One of those classes happens to be the infantil group, which makes me sad since I LOVE that age group. But it does allow me to slowly ease myself into the school and adjust to my job before having all of the grade levels, so it is very nice in that regard. I’ll be sure to keep you all updated on my experience at the colegio and I’m still planning to write a post this weekend about my trip to Segovia when my sister and brother in law were here. I Have Not Abandoned the Blog, I Promise! I am so sorry for my lack of blogging the past 2 weeks!! I’ve been so busy getting all of my things together and settling into my room with my au pair family. Plus, my sister and brother-in-law were with me for the first 10 days and we did a lot of sight seeing. I was getting so many emails asking if I had abandoned the blog. I can assure you all that I will continue updating the blog…there will probably be longer gaps between posts though because I am way busier than I anticipated. Basically, I am in love with Spain. Obviously, Madrid is incredible, but I absolutely loved going to Segovia, Ávila, and Toledo. I think I’m going to dedicate a post to each of the places I visited with my sister during the past week. Day 2 with BEDA was class…from 12-6:30. The topics were the history of the Spanish government and Sports (mainly sports in schools). I kinda died a little. I was not mentally prepared for sitting in lecture for hours. On both days, I came home, ate, drank some coffee, and went to sleep. SIM card for my phone. Right now I’m using Orange and I like it, but I’m going to order a SIM card from Tuenti because they give me more data, which is what I use the most since I use whatsapp and viber a lot to communicate with friends and family. Bought decorative things for my room at Ikea and Leroy Merlin (Spain’s version of Home Depot). The theme for my walls is cities of the world. One wall will be Paris, another London, and another New York City. It’s going to look amazing! I found my mirror and other little things a t Ikea in Alcorcón, so I would highly recommend going there if you want to buy things and get them cheaply. Picked out the paint color for my room. My au pair family is awesome and told me that I get to pick the color for my room and they’re letting me decorate it all as I like. I can’t believe how lucky I’ve been with the family I found. They have truly been the best part of this Spain adventure for me. I went on the bus, train, metro, and a taxi. I have pretty much taken all forms of public transit. I practiced the route to my colegio in Majadahonda and the route to class for BEDA. In the same vein as the public transportation stuff, I purchased my abono at an estanco (tobacco shop). The abono is a pass that is good for the buses, metro, and trains here in Madrid. I paid about 70 euros for mine since I need it to be good for the B2 area, but I never have to worry about paying for transportation this month, which is super nice since I’ll be using it a lot. In the end, the abono is truly a life-saving thing to have if you don’t want to worry about paying for transportation every single time you need to use it, plus it really does save you a lot of money if you use public transportation often. I have learned that, although I speak Spanish, I use a lot of words that Spaniards do not and that Spaniards use a lot of words that I do not. For example, I say gavetas (drawers) and españoles say cajones (NEVER to be confused with cojones…which is something VERY, very different). I say sombrilla for umbrella and españoles say paraguas. And the word I have heard the most since arriving here is, without a doubt, vale. Vale is the Spaniard version of “okay.” Puerto Ricans do not say that word at all, we just use ok. I have already started saying “vale” and I’ve only been here for 2 weeks. I like picking up new vocabulary, though. I think it’s one of the best parts of moving to a new place. There are several other words that I could mention that I’ve learned here or words that I say that are not used here, but I think I’ll leave that for a separate post another day. That’s all for now. I have to get ready to go to the estanco again to see if I can fix an issue I’m having with my abono. Apparently, it’s common for the band on the back of the abono to stop working or get ruined in some way, which is a major issue when you go to get on the metro because when you put your abono through the machine, it starts beeping like mad and won’t let you through (I learned this the hard way). It’s not a problem on the buses because even though the machine will beep and say your card is invalid, you just show the bus driver that it’s an abono for the month, and he lets you sit anyway. I shall update again soon with pictures from the places I visited last week. And on Monday, if I’m not too tired, I will post about my first day at my colegio. 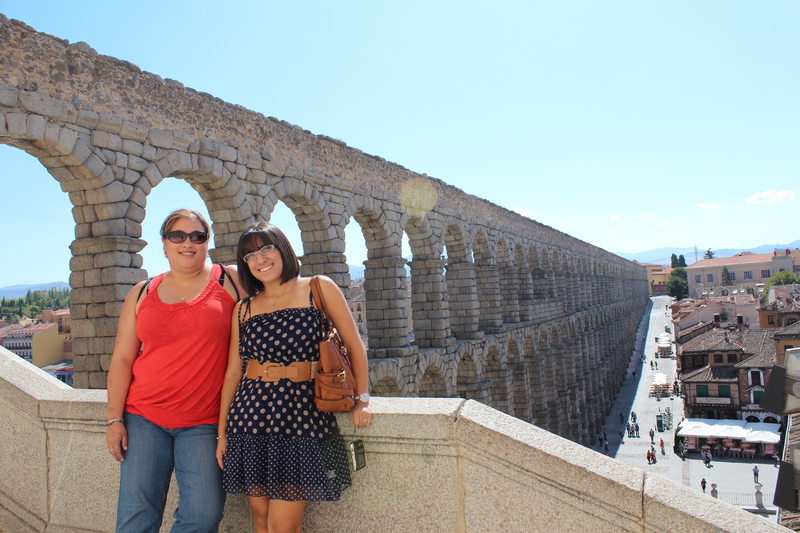 Joelis and I at the aqueduct in Segovia. So I decided that I would try to do away with the procrastinator in me and pack the majority of my things this weekend. I find that I am entirely overwhelmed when it comes to attempting to pack my life into 2 suitcases that may not go over 50 lbs. I am trying so hard not to over-pack, but it’s just not in my nature! I am also the type of person that goes through every single possible scenario, which is what leads to my over-packing. I wrote the principal of my school asking her about the dress code that I am to abide by while I’m there. Once I get a response from her, that should help with my packing a bit. I also tried reading some other blogger’s posts regarding packing, but everyone has different advice! Some say to pack a winter coat from home and others say not to bother because you can just buy one in Spain. Some say to bring you winter clothes with you, while others say to try and have your family send you your winter clothes to save suitcase space. Others say to bring your good shoes while others say you can find great shoes in Spain. It would be a lot easier to follow people’s advice if there was somewhat of a consensus! So, basically, I’m just going to pack as best as I see fit. I’m sure that once I’m in Spain for a few months, I will likely chastise myself for packing so much excess crap…but I guess I’ll just have to learn the hard way. At least packing for my 2nd year shouldn’t be too hard right? Anyone have some packing tips for me? ?